When you donate to OHS, you do so with the knowledge that your dollars are working hard to help animals, and your personal information is kept safe. 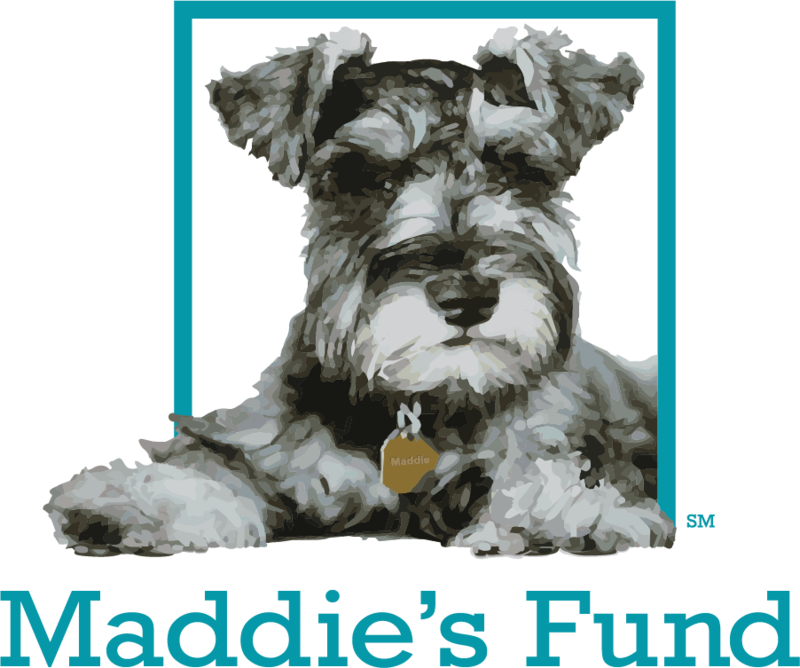 OHS strives to keep administrative and fundraising costs to a minimum. OHS is proud to meet the Better Business Bureau’s Twenty Standards of Charitable Accountability, your assurance of the highest level of financial stewardship for your donation. 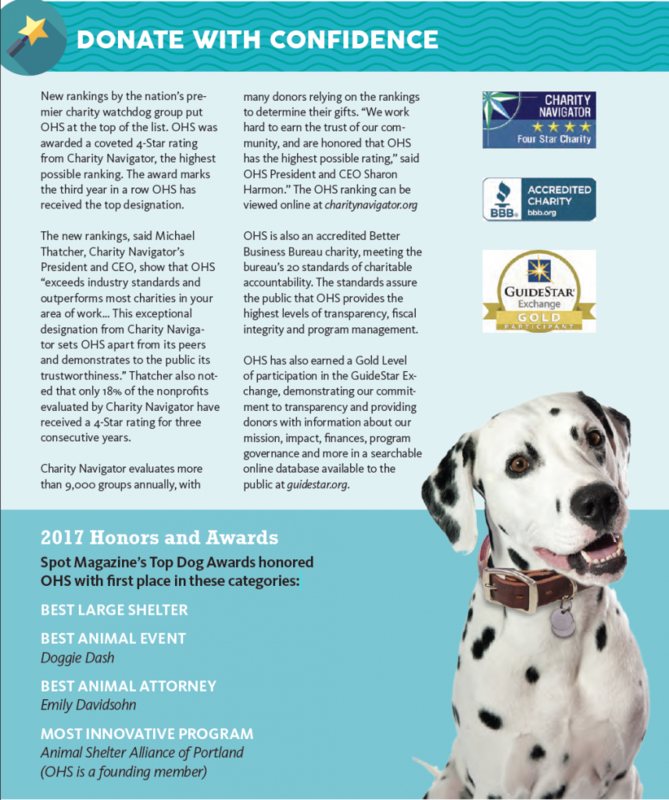 As for our revenue sources, OHS receives no tax dollars and does not receive any portion of donations paid to national humane organizations. 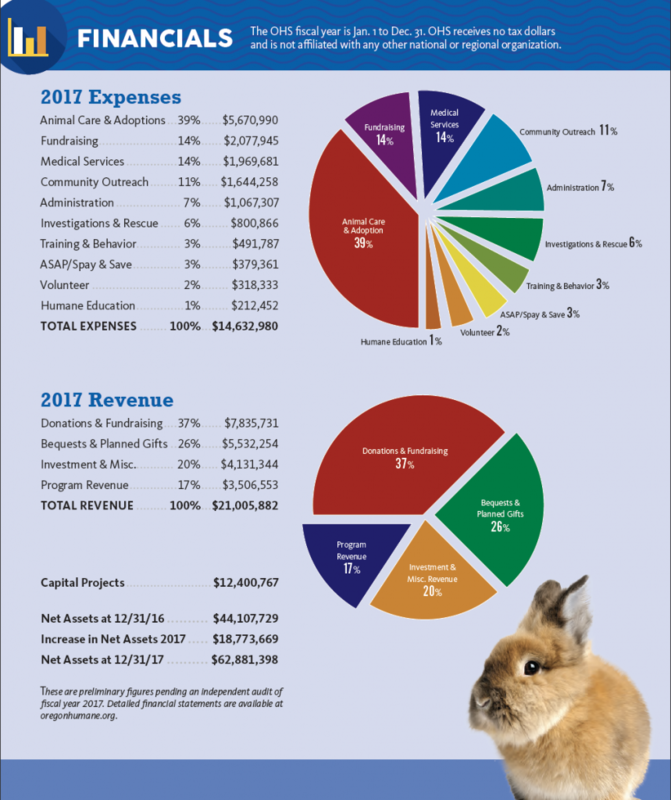 Below is a breakdown of our 2017 finances, taken from the 2017 OHS Annual Report. For more details, see our Annual Reports, IRS 990 forms, and financial statements. OHS meets the highest Better Business Bureau standards of fiscal stewardship. OHS does not collect any personally identifiable information about you unless you voluntarily submit such information to us. This information is used solely by OHS for internal purposes. OHS does not sell or otherwise make available its donors’ private information to businesses or other charities. OHS does not collect information for commercial marketing and does not share its donor list. Priority is given to safeguarding donor confidentiality. OHS does not sell, trade, rent, or otherwise make available personal donor information, nor send mailings on behalf of other organizations. This policy applies to all information received by OHS, both online and offline, as well as any electronic, written, or oral communication. OHS acknowledges supporters by gift range in quarterly publications. If supporters prefer to remain anonymous they can inform OHS of their desire to have their name withheld from supporter lists. OHS respects your privacy and has instituted policies intended to ensure your personal information is handled in a safe and responsible manner. We may use this information to deliver to you information about OHS, as well as for trend analysis, pattern detection, and website administration. Non-personal demographic and profile data is used to tailor your experience at our website, showing you content we think you might be interested in. Occasionally, OHS may contact registered visitors who have provided their personally identifiable information through the website in order to conduct surveys seeking feedback about their experience on this website. These surveys are used for quality assurance purposes to improve our level of customer service. We will only disclose personally identifiable information to third parties when (i) the person submitting the information authorizes us to do so; (ii) sharing the information is a necessary operation of the website (i.e. to process credit card information); and (iii) we are required to do so by law or in the good-faith belief that such action is necessary to (a) conform to the edicts of the law or comply with legal process served on OHS or the website; (b) protect and defend the rights or property of OHS, the website or the visitors to the website, and/or (c) act under exigent circumstances to protect the personal safety of visitors to the website or the public. OHS mandates that no donor information can be sold or shared with another outside entity. By visiting this website you agree that no information you submit to the website shall contain libelous or otherwise unlawful, abusive, or obscene material. You are solely responsible for the content of any information you provide to OHS. We use a third-party advertising company to serve ads when you visit other websites. This company may use information (not including your name, address, email address, or telephone number) about your visits to this website in order to provide advertisements about goods and services of interest to you. If you would like more information about this practice and to know your choices about not having this information used by these companies, click here. All information provided to OHS is transmitted using SSL (Secure Socket Layer) encryption. SSL is a proven coding system that lets your browser automatically encrypt, or scramble, data before you send it to us. We also protect account information by placing it on a secure portion of our Site that is only accessible by certain qualified employees of OHS. Unfortunately, however, no data transmission over the Internet is 100% secure. While we strive to protect your information, we cannot ensure or warrant the security of such information. If a user elects to use our referral service for informing a friend about our website, we ask them for the friend’s name and email address. OHS will automatically send the friend a one-time email inviting them to visit the website. OHS stores this information for the sole purpose of sending this one-time email. Our website contains links to other websites. Please note that when you click on one of these links, you are entering another website for which OHS has no responsibility. We encourage you to read the privacy statements on all such sites as their policies may be different than ours. You may opt out of receiving communications from us by sending an email with your complete name, address, and email address. Any information posted on OHS’s website is for general information purposes only and should not be construed as medical advice, medical opinion, diagnosis, or treatment. Any information provided is not a substitute for medical attention. See your licensed veterinary health-care professional for your pet’s medical advice and treatment. This website and all of the materials on or referenced by the site are provided on an “as is” basis. In no event shall OHS be liable for any direct, indirect, incidental, punitive, or consequential damages of any kind whatsoever with respect to the use of this website. You agree that you are using this website solely at your own risk. By using the OHS website and all its contents, you agree to defend, indemnify, and hold OHS harmless from any and all claims, damages, costs, and expenses, including attorneys’ fees, arising from or related to your use of the website. Your use of this website constitutes an agreement between you and OHS. This agreement, which consists of the terms and conditions set forth herein, shall be governed by, construed under, and enforced in accordance with the laws of the state of Oregon, without regard to any conflict of law provisions. User acknowledges and consents to jurisdiction in Oregon. Any action in connection with, relating to, and/or arising from this agreement shall be brought exclusively in Portland, Oregon, in a federal or state court of competent jurisdiction. This agreement is effective unless and until terminated by either you or OHS. You may terminate this agreement at any time by notifying the OHS by email or mail. OHS may also terminate this agreement at any time and may do so immediately without notice, and accordingly deny you access to the website, if in OHS’s sole discretion you fail to comply with any term or provision of this agreement. Possible evidence of use of this site for illegal purposes may be provided to law enforcement authorities in the discretion of OHS. This is the entire agreement between the parties related to the use of this website.